However, I am 100% sure she would not have picked mine had she known how to read. For several years, I planned a Thanksgiving potluck feast for my young adult bible study. 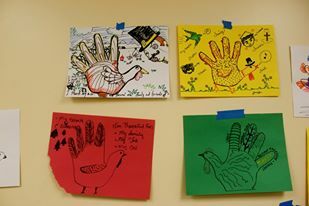 Before we commenced our hour and half of gluttony devouring sweet potato casseroles and two butterball turkeys the size of toddlers, I laid out a cornucopia of markers and crayons for which they were to create hand turkey drawings. 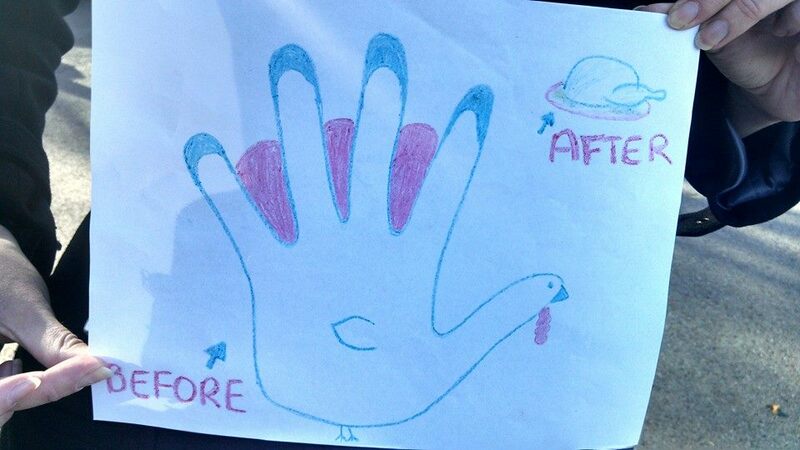 Beside each hand turkey was a list of things, people, or inanimate objects for which they were thankful. Some worked their way up Maslow’s hierarchy of needs, starting first with basic needs of food and shelter before expressing gratitude for relationships of family and friends. There were the techno-enthusiasts singing praises to their iPad or smart phone of their choice, and the dreamers who wanted to thank fall leaves for making that pleasant sound when crunched underneath their leather riding boots. And then there were the handful that still remembered to be thankful for You and even fewer that listed out Christ by name. 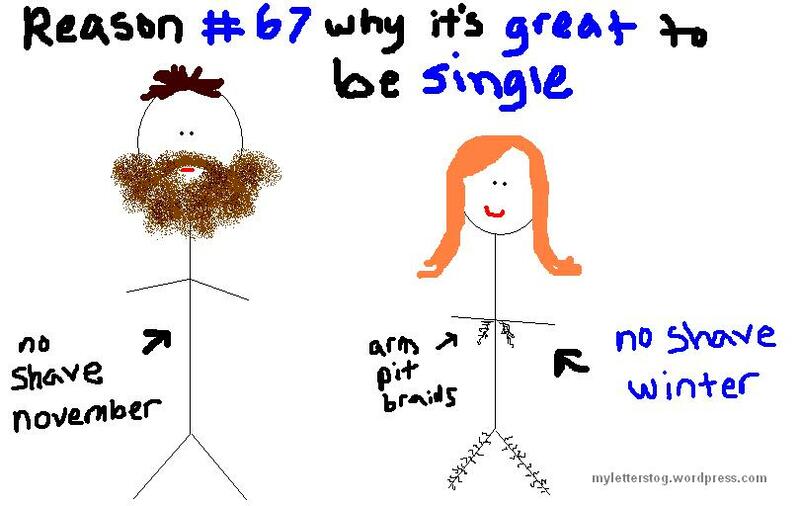 I was always too busy preparing for the dinner to sit down and draw around the outline of my left hand with a brown marker, add some extra feathers in red, yellow, and that little jiggly red thing dangling from his neck like an awkward homemade scarf. But I know what I would say if called upon to list the top three things I was thankful for. The obligatory: God, family, friends. It comes automatically, without any real deep heart reflection. You come first, of course, because that is expected and commanded. Family and friends because it’s true even if it might sound cliché. This list is certainly all well and good but it’s missing something. As I was reading 1 Thessalonians 5:16-18, “Rejoice always, pray continually, give thanks in all circumstances; for this is God’s will for you in Christ Jesus,” the last part of verse 18 stuck with me. Usually we focus on the first three parts, the part about rejoicing, praying, and giving thanks, but the rest of the verse always trailed off in my mind. That little part about Christ always trailed off in my mind. That little part about Christ’s sacrifice always trails off in my mind. And it’s not a little part. As we count our blessings, listing out all the things and people and food and shelter that we are thankful for, we forget the not-so-little-part about Christ’s sacrifice for us. You call us to rejoice, to pray, to be thankful, all through the lens of Christ’s greatest gift of himself on the cross. Why do I always forget that on my list? Cultivate within me a heart that is thankful first and foremost for the gift of eternal life through your Son, Jesus Christ. By viewing my life through the lens of this truth, I won’t want to do anything but rejoice and pray and be thankful without ceasing. Christ’s sacrifice allows me to appreciate the little things because of the biggest thing he did for me. Help me remember what should be first on my thankfulness list. And not just one day in November when my belly is full of food and that chemical in the turkey is kicking in and I’m sleepy and warm and nestled amongst the love of family. Help me remember that because of your love for me through the sacrifice of your Son, I’m nestled amongst the love of a Savior everyday of my life and for all eternity. This was one of my first posts I decided to bring back and reblog today! Enjoy! LOS ANGELES—No amount of high-voltage jolts from a defibrillator were enough to bring to life ABC’s attempt at debuting a Christian Bachelor show. Twenty-nine year old doctor from Tennessee, Tyler Johnson, was left standing with an armful of roses when ABC pulled the plug.